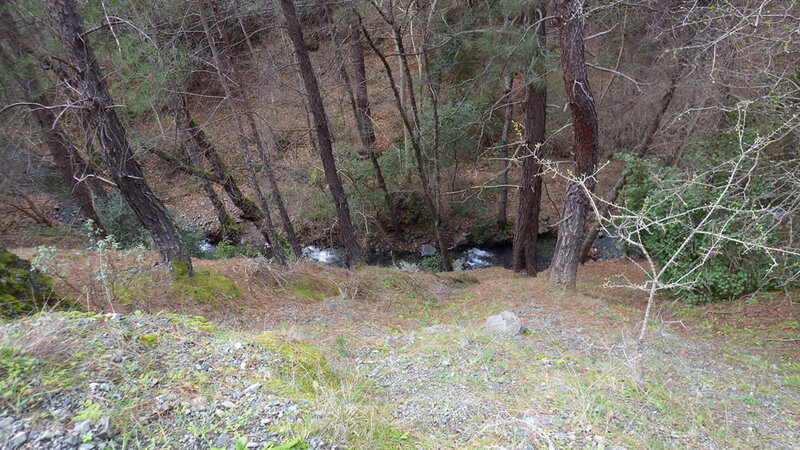 Paphos Forest covers a large part of the Troodos mountain range. 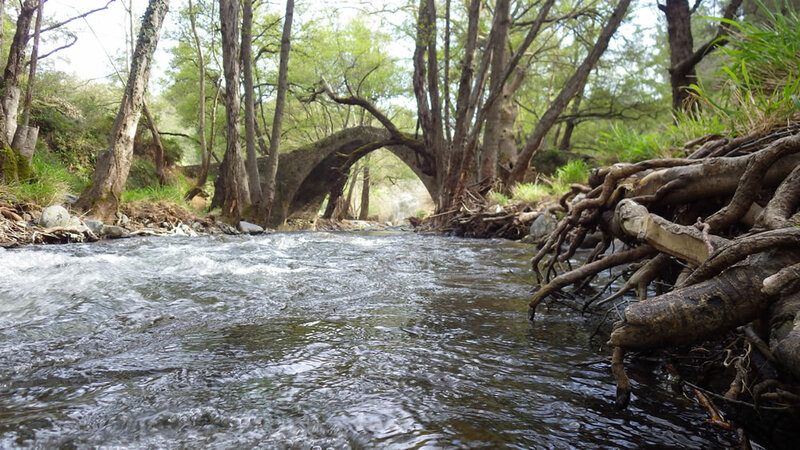 Except for its periphery it has hardly any villages and provides an excellent setting for those seeking to explore Cyprus forests. 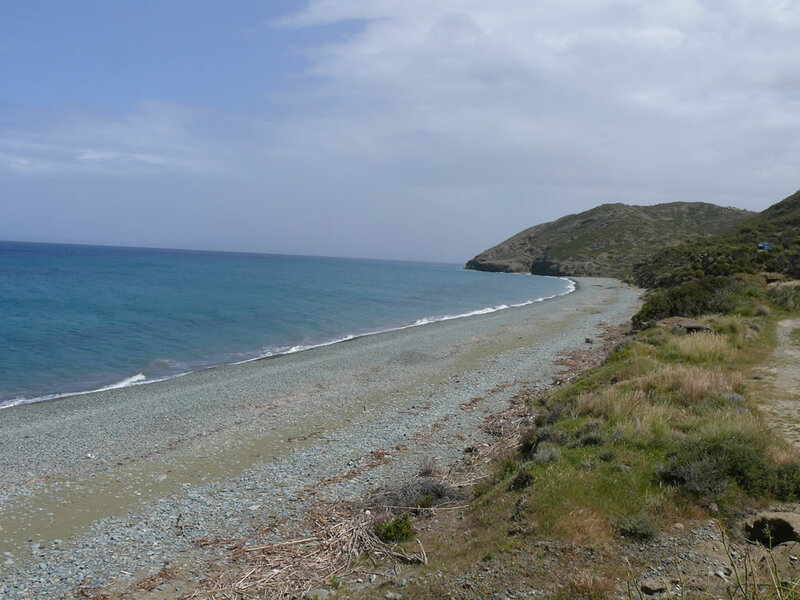 This is a two-days (one night) relatively easy walking trip south and uphill of Pyrgos Tyllirias village and includes camping at the end of the first day's walk. 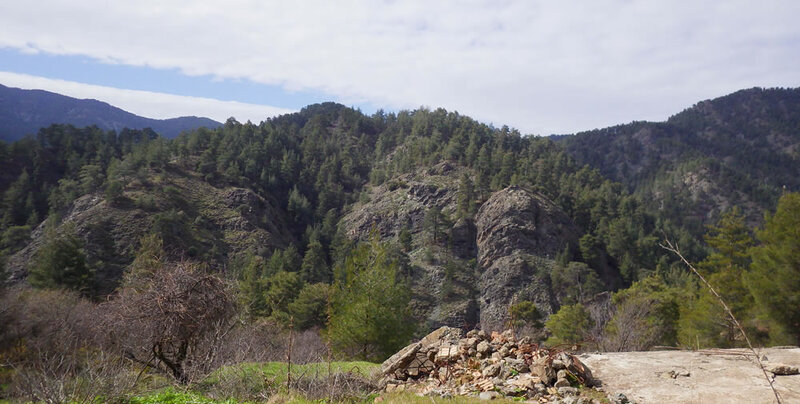 The walk is in an area where no villages exist now, and the route provides walkers with the opportunity to experience the serenity of the Cyprus forest and possibly also spot mouflon. The itinerary combines stretches close to a river bank together with parts along the ridge of mountains, adding considerable variety to the views for the traveller and to the flora along the way. 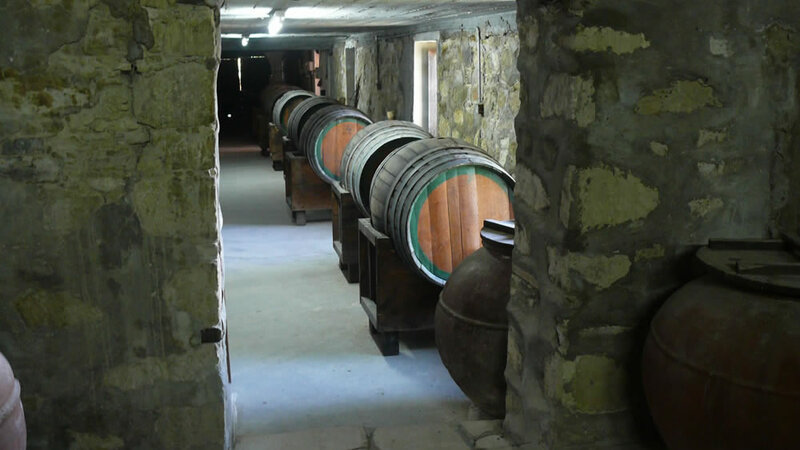 Camping halfway (at the place where the village of Vrodisia once stood) enriches the experience for travellers, providing further opportunities to immerse in beautiful nature, practice skills and bond with fellow travellers. 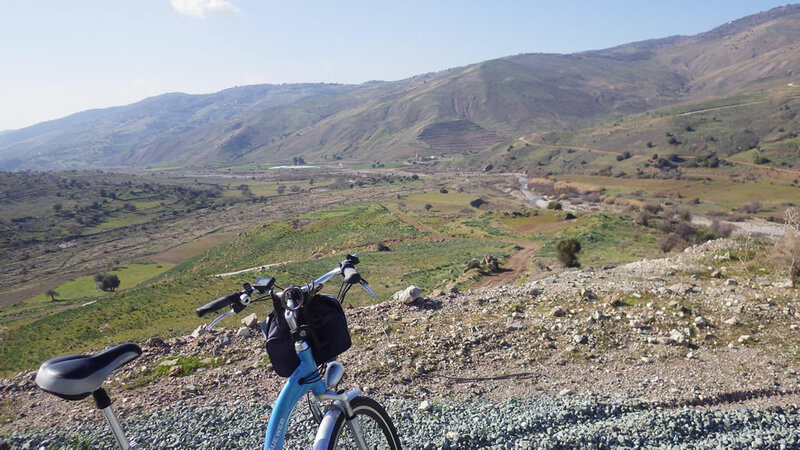 ​On Day 1 we initially drive to a junction of a dirt road with the paved road that connects Pyrgos Tyllirias village with the Orkontas locality. We start walking from there. We walk for just seven km, much of it close to the river bank. Our usual route includes an additional (optional) circular stretch of about eight km, that goes deeper (towards the south) inside Paphos Forest, ending at the same finishing point. 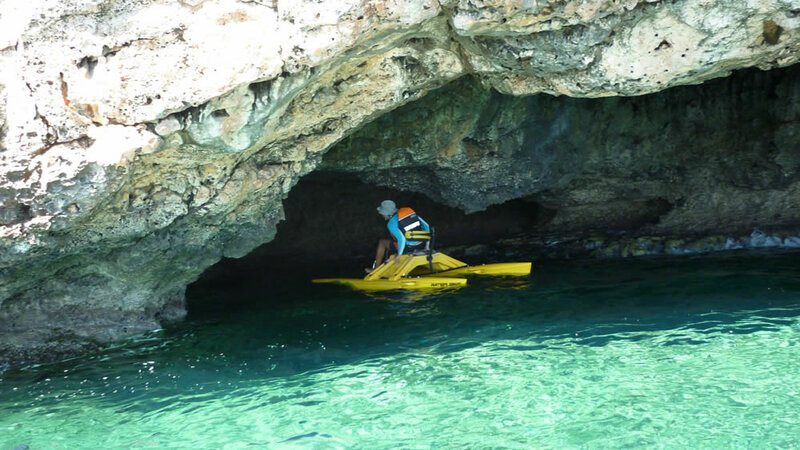 Our tents and relevant equipment as well as dinner will be transported in advance (by the guide while the travellers rest) to the camping ground. The route until we reach the paved road is eleven km. Walkers may choose to stop and wait there until we retrieve our car, or they can walk on the paved road for three and half km to the start of the walk on Day One (and wait there for the car). After we retrieve the car we drive to the nearby coast of Pyrgos Tyllirias for a break by the sea before we return home. On Day 2 our walk starts at our camping ground, which is where the village of Vrodisia once stood. From here we walk largely towards the north east, at or near the mountain ridge until we reach the paved road. 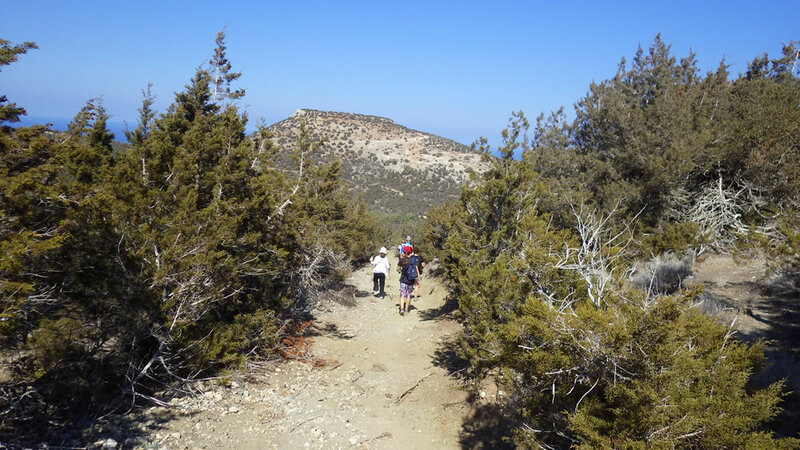 The walk offers incredible vistas of the forest, the valleys and the peaks, at many points as far as the sea and the coast from Akamas towards the north west to Kormakitis towards the north east (as well as towards Pentadactylos mountains). Transportation of travellers to the start and from the finish point of the walking trip (there's also a version where travellers use largely their own transportation, at a discounted price). It should be noted that there are no (toilets or other) facilities at the campsite. ​For some time during the trip, because of logistical issues (moving the car), the travellers will be without the guide. Those who prefer to can use their transportation, at a reduced fee per person. 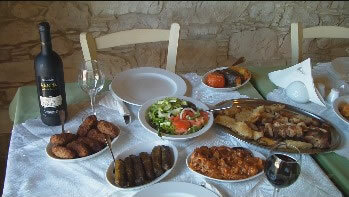 The price per person for our Standard package is 150 Euro. The price per person for travellers using their own transportation is 110 Euro. These prices assume that participants are responsible to bring along their camping equipment (eg tent, mat, sleeping bag, etc). Note: We can assist customers in buying a basic camping equipment (tent, sleeping pad, sleeping bag). If Cyprus Walks Etc cancels for severe expected weather (we do not consider rain as severe weather) or other reason we provide our customers with full refund for the services paid to us. Where possible we provide alternatives, which customers can select instead of refunds if they prefer.